All ZIP files updated 25.04.2013. Edited by Hathor, 25 April 2013 - 11:17 AM. Portfolio Forgotten Isle and gallery at deviantART. I remember those - good grief, was it that long ago? Is there a small portrait of the dark hair/purple cloak version? I'd really like to use that one for a PC. I was surprised, either, time runs too fast. Attached, I'll fix it in the zip, too. Edited by Hathor, 28 April 2013 - 02:47 AM. Fantastic variety of shading throughout! I'd love to see the same kind of work on the rest of the BioWare crew I see most of the FR elven subraces represented in the skin tones, and I'm all about FR lore accuracy. Very cool! 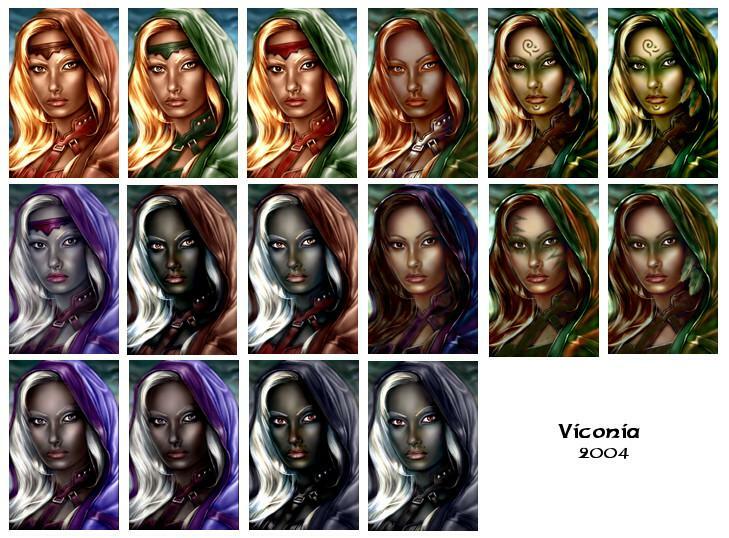 Eric P., thank you, I tried to turn her into Moon, Sun, Wild and Wood elves thus colour and make up variations. Some of these can serve as human as well. I'm sorry but I did it in times where I barely knew there was something like copyrights, today I would not repaint somebody's artwork without permission. I know these are Bioware property and they do not care, so the case is clear (and that's why I re-post these) but that's all. Almateria, she is blue in original for no reason If you've seen Bladerunner there is where I've found make up inspiration for the wood variations. Edited by Hathor, 23 April 2013 - 01:09 AM. I don't see a Moon Elf version. their skin would be very pale and eyes brighter than I did, so we can treat her as a half elf. Hmmm, maybe I'll try to brighten her skin. 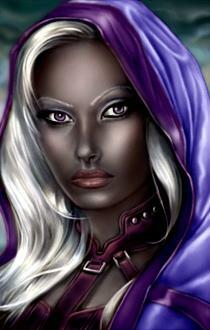 Moon elves have white skin tinged with blue highlights around the ears and chin. Their hair is silver-white, black, or blue. Their eyes are blue or green, with gold flecks. Edited by Hathor, 24 April 2013 - 05:18 AM. Forget that D&D Wiki description. It's crap inconsistent with D&D canon. Yes, lightening/brightening the skin might do the trick. Should be a nice alabaster or porcelain white, tinged with blue, in the same way a Copper Elf's skin is coppery with green accents. Edited by Eric P., 24 April 2013 - 06:41 PM. How can a D&D Wiki be inconsistent with the D&D canon? That's what I did, though it took me longer than I wanted so even if it's not what you imagined that's all I'm going to do. She looks very pale in the game but works. Silver haired with green and blue eyes, and as I wrote above Danny from the Game of Thrones as a purple eyed bonus The blue eyed variant has got more blue hues in skin. ZIP file added in the first post. It includes the largest variants of green and blue eyes, so if anyone wants to alter it more go ahead, just remember to credit the source (link back here), so others can find the original recolors, too. Edited by Hathor, 25 April 2013 - 11:16 AM. I don't know where the description in that Wiki article comes from, but there's no precedent (at least not before it was written there) for Moon Elves with vampirelike qualities. Edited by Eric P., 26 April 2013 - 08:05 AM. So...very...beautiful... Those Moon Elf portraits are fantastic!!! Would be nice to see some with the other hair colors for Moon Elves, but this alone is superb!